California’s Legislative Analyst cast doubt on the state’s latest experiment in privatizing highways in a November 8 report, saying essentially that California has few safeguards in place to prevent wasteful contracts from being signed for so-called “public-private partnerships.” The report also says that the state’s first two big projects under the new privatization program, a road in San Francisco, and a courthouse in Long Beach, may have devoured $300 million more than if they had proceeded as public investments. California’s public-private partnership (P3) program for highway privatization began in 2009 when outgoing governor Arnold Schwarzenegger signed SB 4. SB 4 allows private companies to finance, build, operate, and maintain public roads under multi-decade concession contracts. 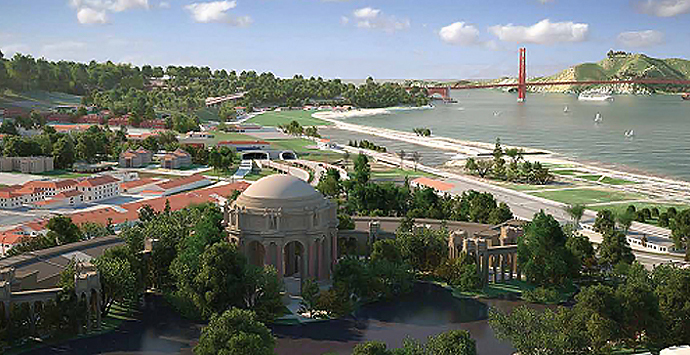 Governor Jerry Brown has taken a wait-and-see approach to the program by allowing the first big transportation project to move ahead – San Francisco’s Presidio Parkway. A rendition of Presidio Parkway. The project replaces the elevated Doyle Drive, built in the 1930s with New Deal federal funding, with several tunnels and viaducts through the Presidio approaching the Golden Gate Bridge. In 2011 California’s Department of Transportation (Caltrans) and the San Francisco County Transportation Authority signed an agreement with Golden Link Partners (a consortium that includes the French investment bank Meridiam Infrastructure, the German construction company Hochtief, and AECOM, an American engineering firm) to finance, construct, maintain, and operate the replacement span for Doyle Drive, the elevated approach to the Golden Gate Bridge. Under the terms of the contract, Golden Link Partners were to match private capital with public funds to build the road. It’s slated to be finished in 2015. The partners have a 30-year concession which promises them over a billion in revenues through availability payments if they meet certain performance goals along the way. Privatization of Presidio Parkway, as the road is now called, was opposed by the Professional Engineers in California Government (PECG), a union of state engineers. PECG claimed it would cost taxpayers more, and expose the public to greater risks associated with private control over infrastructure investment. The union sued to stop the project, contending that SB 4 didn’t in fact authorize the use of availability payments to repay private investors in highway projects. A state judge briefly halted the project, but in early 2011 lifted a temporary restraining order and allowed the privatization scheme to move ahead. According to Mac Taylor, the state’s Legislative Analyst, the selection of Presidio Parkway for privatization was a mistake, one that is likely costing taxpayers upwards of $140 million more than if it had moved forward as a public project put out to multiple competing bids, and financed with state transportation bonds instead of private debt and equity. The LAO went one step further than simply commenting on Caltrans’ selection criteria by running their own analysis of Presidio Parkway, using what they judged to be more reasonable assumptions about the project’s costs and potential risks. According to LAO’s analysis, taxpayers have lost about $140 million by handing Presidio Parkway over to Golden Link Partners. Jose Luis Moscovich, director of San Francisco’s County Transportation Agency, also supported privatization of Presidio Parkway, stating at the time that it would actually provide cost savings of approximately $150 million compared to procurement under the traditional design-bid-build process. The Legislative Analyst Office stated in their report, however, that the selection factors used by Bonner and Moscovich’s staff at the time “do not constitute a robust set of screening criteria,” to determine a project’s suitability for privatization. Furthermore, the LAO report explains that Presidio Parkway’s advanced stage made any transfer of risk to the private investors a moot point. “[T]he Presidio Parkway project was too far along to transfer many of the project’s risks to a private partner. This is because the Presidio Parkway’s first phase of construction was already underway using a design-bid-build procurement when the second phase of the project was selected for P3 procurement.” According to the LAO, this caused the state to retain “significant risk,” even while paying more under the terms of privatization. More generally the LAO report says California lacks a transparent and objective process to judge any and all potential P3 projects. This exposes the public to numerous potential harms, some of which the LAO lists: increased financing costs, greater possibility for unforeseen challenges, limited government flexibility, new risks from a complex procurement process, and fewer bidders which drives up prices. Both of these highway projects were in fact plagued with problems. While the SR 91 was profitable for its investors —Level 3 Communications, Granite Construction, Inc., and Cofiroute SA— these corporations actually sued California to prevent freeway improvements along nearby public routes because it would potentially chip into their profits from the toll road. They prevailed in this obstructive effort because their contract did in fact prohibit competition. This led to a costly solution; a regional transportation agency was forced to purchase the express lanes in 2003. In San Diego the South Bay Expressway actually went bankrupt when traffic projections failed to pan out. The private investors for that project, a group of banks and the Australian equity fund Macquarie Capital, recouped some losses by convincing a bankruptcy judge to write down debt on federally subsidized loans that floated the project. Like the SR 91 Express Lanes, the South Bay Expressway was purchased by a regional transportation agency in 2011 for $345 million, yet another loss to the public. 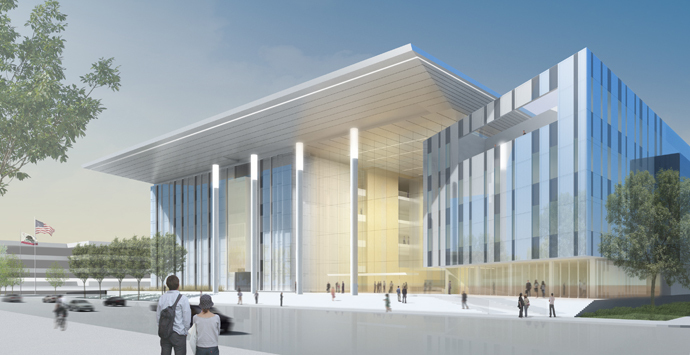 The other P3 project addressed in the Legislative Analyst’s report is the Long Beach Courthouse, procured under a $492 million, 35-year lease-back agreement. As with Presidio Parkway, Meridiam Infrastructure is also the lead investor in the Long Beach Courthouse, with debt financing coming from six global investment banks. According to the LAO, similar biases and assumptions that created a favorable analysis for Presidio Parkway also over-stated the financial advantage of privatization the Long Beach Courthouse. By assuming an unjustified tax adjustment, overstating cost overruns, over-stating the potential leasing of additional space, and by assuming unrealistic project delays under public procurement, project managers may have cost the public $160 million when they handed control to the private investors. Private investors have big plans for highways in California. SB 4 authorizes an unlimited number of P3 transportation projects. Big multi-national investment banks and construction companies have busied themselves since 2009 in scoping out potential privatization opportunities, and in retaining lobbyists and law firms to support their efforts. According to Caltrans officials the next projects likely to be privatized will be four major highway modifications in the Los Angeles Metro region. When Bill Clinton was elected in 1993 US Treasury bond yields were trading around 5 percent. Within a year prices dipped and yields shot upward of 8 percent. The bond market —meaning a relatively elite coterie of highly paid investment managers working for the largest global banks, insurance companies, and mutual funds— was sending a signal to the new administration: cut spending, reduce the federal deficit, and do whatever else necessary to reverse possible inflationary forces. Inflation is the mortal enemy of the rentier whose profits depend on interest rates outpacing the growth of prices. Clinton complied. As a first-term president hoping for a sequel, Clinton knew that US government bond prices and yields respond to changes in monetary policy. If the bond market’s major players wanted to cause trouble by selling their holdings, as they were already doing, it would become costly to finance federal government. If the bond market’s masters could be appeased, they would hold their securities, purchase more, and yields would drop. Clinton’s team set a contractionary monetary policy in motion. Luckily the economy grew in spite of these measures during Clinton’s first term, leading to his re-election. That appeasing the bond market’s masters also required imposing austerity measures above and beyond what the Democrats had planned for upset some liberals in the administration. That sentiment about sums up the relationship between capital, perhaps most purely personified in the financial rentiers who buy and sell government bonds, and the state, personified by the countless local and state governments always seeking to borrow capital, and always intimidated by those who have it. Capitalism may have emerged as a mercantilist system sometimes at odds with the monarchs and priests who ran early state bureaucracies. Capitalism may have undergone an industrial revolution and seen various phases of hegemony in which the merchant and manufacturer have called the shots, but capitalism’s real center of power all along has been the financier. Lest we forget, the financier emerged not as the venturesome investor supporting the expansion of companies and funding the ideas of private entrepreneurs. Rather, the financier emerged first to fund the state and its wars. Ever since there has existed a relationship between private capital and the government defined by the rentier’s thirst for yields that outpace inflation, and exchange rate changes, and the state’s thirst for access to debt financing. In the US, however, we see the most fine-tuned, rationalized, and massive combination of private capital and state finances. For all the variations between states and among the multitudes of counties and cities in the federal system, the public’s finances are remarkably standardized, and capital’s role, and the power it wields over the people at all levels of government is rather the same whether you’re in Seattle or Puerto Rico. And what is capital’s role today in the public finance of the United States? What is the power of the bank, the private bond holder, the fund manager, or the broker over the various governmental units of the commonwealth? The state and capital are certainly co-dependents; capital depends on the state’s powers of monopoly violence, law, and regulation; and the state depends on capital for its fiscal life. Capitalism is defined by the private ownership of capital, however. Thus the state itself exists in a world in which fiscal power can only be borrowed and taxed, and not manifested by powers intrinsic to the state itself. Enough theory though, what of the actual world we inhabit? What this means for all of us living in actual communities, bounded by the fiscal authority of cities, counties, and states, inside units of government that do not even have the power to print money or set central bank rates, what this means is that a small number of financial institutions that control enormous concentrated pools of capital have a strange kind of power over our collective lives. These modern day lords of finance determine the terms on which our communities’ may access credit and capital. The few banks, insurers, and brokers that dominate public finance markets hold enormous sway over our decisions about whether and how to invest in schools, clean up the environment, pay for public safety, provision healthcare and housing. Or to do the opposite of these very things, to disinvest in public schools, subsidize polluting corporations, build prisons for the poor and luxury apartments for the rich – after all, our politics are hardly always beneficent attempts to provision public goods. The rentiers do not often directly influence the what, where, and why of public spending, but they do control the how and when. Their over-arching goal isn’t to pick specific winners and losers in local politics – although there are dominant political philosophies popular among the lords of municipal finance, various conservative hues informed by fears of inflation, and hostile to other practical options that tend to foster egalitarian relations (think full employment policies like deficit spending, for example). Really though they don’t care much if cities spend the people’s credit on affordable housing and hospitals or five star hotels and casinos. They only care that they maximize the wealth that can be extracted from the public through claims they make on future state revenues. They draw the blood of cities, mindful that taking too much will kill the patient, but always pushing the limits to secure a maximum rate of return. Gold in the vault, treasure. Last week I mingled with the contemporary lords of municipal finance at one of their annual industry conventions, the Bond Buyer’s California Public Finance Conference. This particular gathering holds an important place on the calendars of the financiers. California is the biggest single market for public debt in the United States. With its numerous agencies and regional authorities, its 58 counties and 482 cities, California contains 38 million residents, and encapsulates a $2 trillion economy, a big chunk of which includes state and local spending on everything from the salaries of 352,000 public employees who teach millions of children in hundreds of school districts across the state, to paying the salaries of 31,000 more government workers employed to lock up roughly 400 out of every 100,000 of the state’s residents, mostly Black and Latino men from Los Angeles and the Bay Area cities. Prisons, schools, roads, airports, sewers, bridges, utilities, water, railways, housing, hospitals…. The fiscal affairs of California’s state agencies and local governments are complex due to the state’s tax system, sabotaged as it was by conservative libertarians in the late 1970s who mostly were just interested in securing the interests of parochial real estate rentiers, mere millionaires, apartment owners and small-time commercial real estate tycoons. In doing so they crippled cities and counties, creating an opening for global financial companies to increase their overall claims on the state’s tax receipts. The mismatch between California’s flow of tax revenues, and its actual budgetary requirements, both in terms of timing and magnitudes, makes the Golden State desperate for, well, gold, and lots of it. It’s these gargantuan borrowing needs of California governments that makes the state more important, and lucrative to the financiers than probably any other state. No other market offers so much capacity and has such a desperate need for borrowing throughout the year. The modern public finance industry has devised innumerable novel products for California’s governments in perpetual search for more elastic money. No longer does the market rest on auction rate general obligation bonds – the boring traditional securities traded once upon a time by prudent Anglo-Saxon men with degrees from Yale and Stanford, managing their balanced portfolios, clipping their coupons in the same Manhattan and San Francisco offices where bonds were bought and sold over a century ago. Government entities now routinely borrow using revenue anticipation notes tied to expected tax or fee income collected later in the annual cycle. Expectations are more speculative. The volatility of the economy weighs heavily on everything. Bonds and notes have proliferated into numerous varieties tied to specific taxes or fees and now often have variable interest rates. California municipalities like Oakland and Sonoma County invented the pension obligation bond to pay down scandalously expensive pensions for retired cops and bureaucrats, and devised parcel taxes and other tax overrides to pair with said debts. Cities like San Francisco devised lease revenue bonds to channel incomes generated by public assets like parking garages, parking meters, buses and street cars, to investors. Cities and counties across the state have utilized lease-leaseback and sale-leaseback deals, tax increment financing, business improvement districts, private activity bonds, and numerous other novel finance arrangements to raise capital over the past several decades. All raised money, but at what cost? As the types of debt instruments have grown in number and complexity, and their financial impact on communities becomes more difficult to discern, what has become clear is how these products enable private parties to harvest value from the social product of the city. In the 1990s and early 2000s even more complicated and opaque financial innovations multiplied in both the asset and liability columns of the public’s books. Cities, counties, and other agencies agreed to complicated interest rate swap agreements to trade variable rate debt payments for synthetic fixed obligations on billions in nominal debt. Other derivatives like guaranteed investment contracts (GICs) or even CDOs were purchased by local governments because the banks told them they were safe, temporary places to park public dollars. Some public officials even gambled on derivatives. Along with these innovations in public finance (which often costs governments dearly, even if the financiers made their bucks back) are new experiments in infrastructure procurement. So-called public private partnerships have been authorized for highway and road projects across the state, and there’s even a courthouse in Long Beach that will be built and managed by private companies who will in essence lease it back to the state. Proponents of these forms of privatization claims such complicated P3 agreements will stretch public dollars across a greater number projects, getting more miles of asphalt out of every borrowed dollar. Whether they will or not remains to be seen. The track record is mixed on California’s first two P3 highways. Even so the state’s big public pension funds are rumored to be interested in placing money with infrastructure investment funds controlled by private equity groups and investment banks. What they do immediately accomplish is clear. P3 deals provide yet another way for private investors to make claims on the wealth that the people as a social totality generate. Alongside these privatized highways, the Golden State’s ports are now being handed over to private consortiums of financiers who back terminal operating corporations. It’s yet another twist on the privatization of infrastructure that stops short of actually selling the assets off to investors, but still provides them with all the benefits a private owner would have. 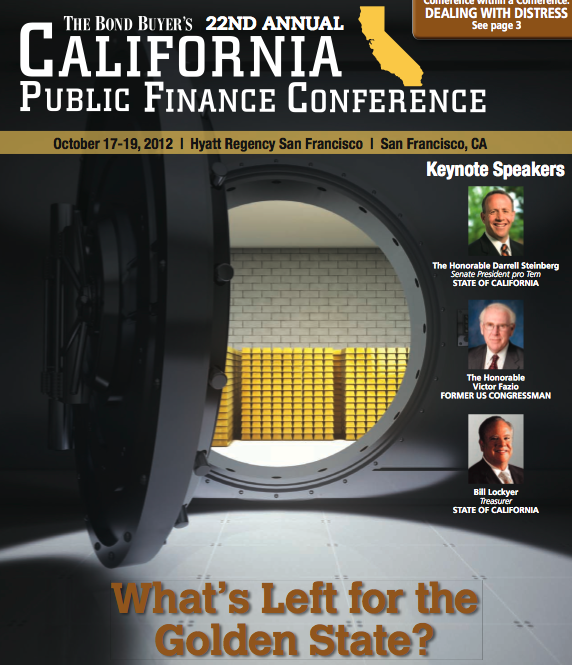 The Bond Buyer’s California Public Finance Conference included all the chatter you would expect about these and other opportunities for the lords of finance to magnify their claims on the social capacity to produce wealth. A workshop was scheduled to discuss San Francisco’s privatized road Presidio Parkway, effectively sold to a German construction company and a French bank. 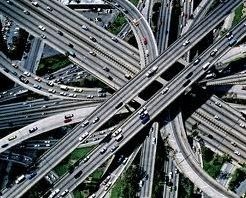 It’s a model privatization project that is soon to be replicated in the Los Angeles region with other highways. Spanish, German, French, Australian, and US corporations and investment banks are said to be circling Sacramento, Los Angeles, San Francisco, and other regions in search of billion dollar infrastructure concessions. Toll roads that will be owned by private investors were discussed in another workshop under the guidance of a managing director from JP Mogan Securities. Another workshop delved into profitable investment strategies for those looking to purchase “distressed” debt from struggling cities, of which there are plenty in California. “Asset sales and other ways of restoring fiscal balance,” was one of the conference’s concluding sessions. Schwarzenegger tried to sell off state buildings during the last months of his presidency in 2010. The net proceeds would have been about $1.2 billion for two dozen edifices. California’s budget gap was almost $10 billion in 2011. But before the main event and all these insightful workshops promoting strategies to intensify extraction of profits from the state was a pre-conference luncheon and discussion for the investors seeking an inside track. In the Merchant’s Exchange building, described as the city’s “commercial club,” a place “where city leaders and businessmen [meet] to socialize and address the issues of the day,” Bond Buyer conference attendees crowded in for lunch with California’s Treasurer Bill Lockyer. Lockyer told the audience, mostly middle-aged men in grey and blue suits with short haircuts, that he plans to sell $7.5 billion in state bonds through the next fiscal year, a big jump over the previous twelve months. 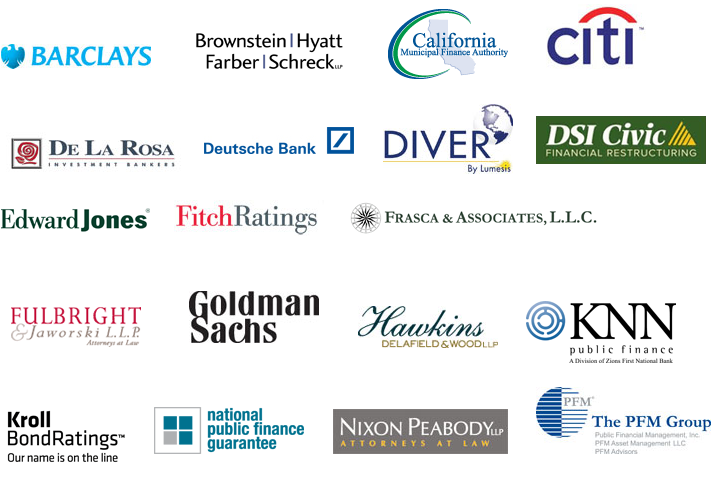 Some of the sponsors of the Bond Buyers’ annual California conference. The elephant in the room?, California’s reputation as the most indebted state, and the recent bankruptcy of Stockton. The financiers, packed into the Merchant Exchange’s lavish Julia Morgan Ballroom, 15 floors above the “Wall Street of the West,” the intersection of Montgomery and California Streets, speculated with one another between speeches about the ability of local governments to repay debt. Would defaults ensue? Their co-dependence on the state was apparent, their anxiety palpable. These fears were quickly addressed by speakers from credit rating agencies and current and former city officials. Their general conclusion was to assure the investors: “I genuinely believe these cities are outliers,” said Bill Statler, a conservative public finance director retired from San Luis Obispo who is well-liked by the rentiers. The fear among bondholders with Stockton, Vallejo, and few other California cities that have gone into bankruptcy, has everything to do with privilege, and maintaining their capital against the general deflation that has struck most plebeians. They should not be subject to the loss of capital that workers, children, the poor and elderly of indebted cities are. James Spiotto, a lawyer who represents a few lords of municipal finance, complained of unfairness to capital: “the bondholders and insurers’ concern is, look, if we provide money to help these people are we just second-class citizens?” Such histrionics is typical when profitable yields are threatened by the collapse of a community due to growing poverty and geographic disinvestment whose social realities are brutal and violent on the ground. Stockton and Vallejo have become harsh places to live for those who cannot escape behind the walls of gated communities and private schools. Those left behind in California’s hollowed out post-industrial, post-Prop 13, post-dotcom, post-housing bubble towns have been abandoned by corporate capital and the state’s wealthy households, but are still expected to pay back debts that harken back to prior eras and bygone social contracts. An ad in the Bond Buyers’ conference guide, shoe shines brought to you by BNY Mellon, the largest custodial bank in the world, entrusted with the funds of thousands of governments and agencies. “During the Great Depression we saw 5000 bankruptcies. We’re not seeing anything like those sorts of numbers,” Statler reassured the bondholders. “Does Stockton tell us anything? There’s over 400 cities in California that just emerged from the worst economic crisis in over seventy years, and just a few have declared bankruptcy.” Bankruptcy could require that the lords of municipal finance take a hair cut, a loss on their returns, rather than requiring public employees to be axed, schools to close down, and healthcare services to be withdrawn. Most of the professionals who work for local governments in their finance offices are fiscal conservatives who, thanks in no small part to meet-and-greets like the Bond Buyer conference, identify more with the rentiers who lend the money, than the working families in the cities who employ them. It’s routine for public finance officials to make upwards of $100,000. Oakland is one of California’s most bled patients. 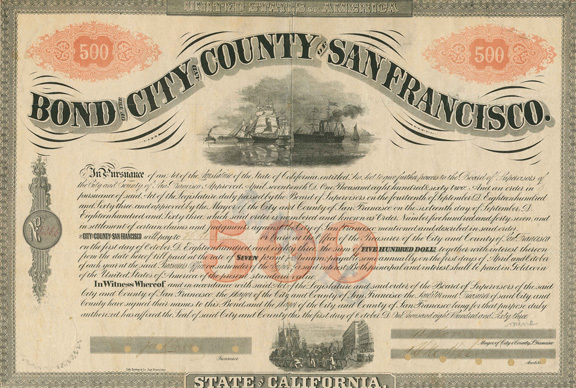 The “five-and-dime” port city across the Bay from imperial San Francisco has issued billions in bonds and notes over several decades, not always under favorable terms. Scott Johnson, Oakland’s finance director, was called on to address the rentiers, as a representative of on their most lucrative, but also troubled sites of wealth extraction. Johnson’s message was reformist in tone, explaining austerity reforms his team of budget crafters has advanced. “We have trained our city council,” said Johnson of the lengths his staff have gone to keep local elected officials from seeking to restore badly needed services. “We keep them better informed about the realities. There have been many times in closed session negotiations with the labor unions, if there’s a surplus of funds, members of the City Council will say, ‘can’t we give some of that back? '” Johnson sees his job as inspiring fiscal discipline in his bosses, the City Council, in order to appease the bond markets and secure cheaper loans. It’s a situation of forced austerity not unlike that described by James Carville. “When I came in as finance director the reserve was low, and we had to work with the Council and employees to re-establish reserve levels,” said Johnson, who actually makes a relatively modest salary compared to others in his position, about $83,000 in total compensation last year. By comparison Mark Bichsel, the finance director of Piedmont, the affluent “city of millionaires” in the hills above Oakland, indeed completely surrounded by Oakland like some archaic city-state that has raised the drawbridge around the moat to protect its exorbitant home values from the working class urban swamp below, earned $243,000 last year. Reserves are maintained to ensure the rentiers that their bonds will reap full repayment, of course. A city is by no means required by any natural laws of economics to maintain high reserves, or to comply with many other austere measures favored by today’s public finance professionals. The existence of such standards is more a measure of the power of capital over local government, than a measure of any sort of rational or humane economic system. With the end of the pre-conference panels the financiers left the Merchants Exchange, walking down California Street to the Hyatt Hotel, where the main events were schedule for the next two days. Greeting them out front, a picket of workers, foreclosed homeowners, SEIU 1021’s militant rank and file, Occupy San Francisco activists, Oakland’s the Coalition to Stop Goldman Sachs, activists with ACCE, among other rabble. The Hyatt’s own cleaning staff are currently engaged in a battle with the hotel’s management, and some labor leaders urged public officials to boycott the Bond Buyer conference because of its location. The US Federal Reserve Bank of San Francisco (est. 1913), not as old as the Bond Buyer Magazine (est. in 1891), and arguably too much the servant of the bond markets, was since September of 2011 the gathering point of Occupy protesters. Occupy San Francisco established a camp in front and stacked literature about economic inequality, political corruption, and policy brutality on tables for pedestrians to pick up. The police busted the camp and tables down several times. Like everywhere else Occupy on the ground has been a street battle between the activists and cops. “Don’t label it. Don’t call it Occupy!,” screamed the voice under the corporate towers of the city’s financial district, before the glass facade of the Federal Reserve. Inside the Hyatt the conference officially began with a panel moderated by Ian Parker, a vice president at Goldman Sachs: “[the] global economic and interest rate environment, and how munis are priced as a result.” Parker runs the public sector and infrastructure banking group in Goldman’s west coast office, located just five blocks up from the Hyatt in the old Bank of America building. Protesters outside the Bond Buyer conference. As he set into his introductory remarks came shouts from the crowd, protesters who had infiltrated the conference. “Stop the swap! We demand that your company stop the swap with Oakland,” they yelled, lifting signs above the balding heads of piqued bankers and lawyers. Parker knew immediately who they were and what they wanted. In 1997 Goldman Sachs signed an interest rate swap agreement with Oakland, promising cheaper rates on $187 million in bonds the city planned to sell the next year. The city’s leaders, influenced by their financial advisers and Goldman Sachs, tweaked the swap deal twice over the next seven years to create more funny money. When the economic crash came in 2008 Oakland was one of hundreds of local governments left holding a toxic swap derivative that sucked millions from the city every year. The title of the panel about to be moderated by Parker couldn’t have been more appropriate given that the global interest rate environment, determined very much by the political decisions of central bankers and a handful of cartel-like corporate banks working through institutions such as the British Bankers Association’s LIBOR, have the power to raise or lower interest rates, a power that profoundly affects debt-strapped local governments. 2012 was a different kind of year for the Bond Buyer conference. The protest created buzz inside. One can only imagine the guilt and worry of various banking executives, wondering if the protest was specifically directed at them, probably hoping it was just abstract frustration. Or perhaps they found it funny, a source of amusement, content to tell one another that the hordes below know not of what they speak. But increasingly they do. Detailed knowledge of the economy and public finance, how it actually works, who it harms, and who benefits, can be a dangerous thing. Revelations about the moral system of modern day usury that dominates public finance can be shocking and mobilizing moments. 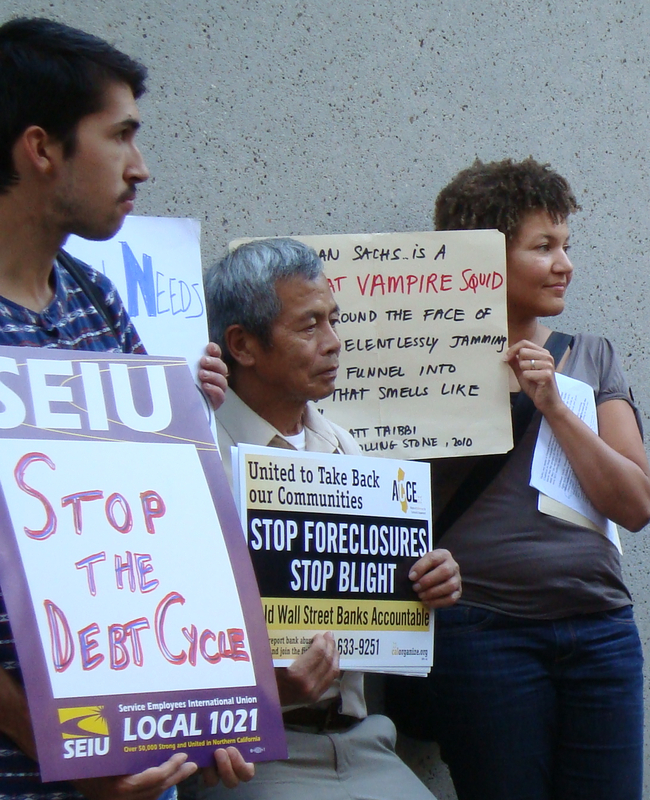 The complaints of bond investors who fear cities might treat them as “second class citizens” by reducing the profits they can harvest on public debt seem perverse when the real second class citizens, children, the poor, and the elderly, must endure school closures, crumbling streets, disappearing social services and the general disintegration of the safety net.